Berkeley Tandem is a wholesale manufacturer of framed awards that incorporate high-end design with print, custom framing and product design. Our award products provide a high-impact, custom, personalized presentation for clients to recognize sales goals, service, corporate and individual donor support, training and individual achievement. 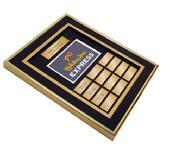 Our products leverage variable data digital printing to personalize each award. We can provide award kits for organizations to use on as-needed bases or provide turnkey fulfillment to compliment any HR, volunteer, training or donor recognition program. We serve clients on a national level with fulfillment and assembly located in Nashville, TN and Howell, NJ. Custom design & manufacturing of award products, electronic imaging, digital printing, custom framing, marketing through awards, product design, certificates for training, framed specialty products, recognition products, certificate design, certificate frames, fulfillment, wholesale product development for retail, recognition program development, sales awards, employee of the month awards, foil stamping, die cutting, off set printing.